Everything about the experience of Basilica di Santa Cecilia in Trastevere impresses humility on its beholders, despite the site’s innate grandeur. This titular church resides below the Viale di Trastevere, away from the tourists in the Basilica di Santa Maria and set apart from any packed piazzas. In typical Roman fashion, one has to navigate with perseverance the tiny cobbled alleyways before arriving at the quiet destination. Beyond a tranquil courtyard sits the medieval church (with a Baroque facade) built on top of the ruins of Saint Cecilia’s own home. Once inside, you are gravitationally drawn to the central altar – not by the colorful apse (that is only lighted for mass) nor the 13th-century ciborium, but by the pure gleam of a sculpture lying just below one’s line of vision in a black-marble niche: Stefano Maderno’s masterpiece, Santa Cecilia. It is one of very few pieces we have from this obscure artist of the late 16th century, and by far his best. Maderno was supposedly very young when Cardinal Sfondrato commissioned this piece in 1599, in the midst of massive excavations and restorations of the church – in fact, the astonishing sculpture was most likely Maderno’s first public commission. Even without any context, it is a most unusual sculpture, guaranteed to provoke deep emotion. The completely obscured face of the martyr, turned down into the ground and away from her spectators, is incredibly striking. It both represents and inspires introspection. As Maderno’s first public commission, it surely is a strong and deft statement. While the saint’s linens and form are rendered beautifully, and certainly add to the overall impact, the mere visual absence of Saint Cecilia’s face dramatizes and animates the piece in masterfully. In her plea to Valerian, Cecilia clearly cherishes the sanctity of her body and fears any impure touch and draws a distinction between a love that is “polluto” and one that is “sincero.” Her love for God requires that she protect herself, and thus her body, from any sort of “polluto amore.” She threatens Valerian that, should he touch her, his “florem…gratissimae juventutis” will be snatched away by God – and this is surely the fate that she herself is desperate to avoid. Preservation of her own “florem” is of utmost importance. Cecilia in fact succeeded in converting her husband, and so their marriage remained a spiritual one. While her body’s purity is not quite enough to save her life, her ability to live on for three more days “semivivam” did allow her to give her possessions to the poor and dedicate her home to the church. If you visit the Basilica today, you can enter the scavi below and see the remains of what was quite a grand house as well as visit the martyr’s remains. Bosio’s account further attests to the seemingly miraculous preservation of Saint Cecilia’s body – even in death, her body retained the appearance of life. And it was in this vein that Cardinal Sfondrato commissioned the sculpture. In fact, you can see the three strikes in her neck, as well as droplets of blood (see picture above) – further asserting her body’s incorruption. Maderno’s piece is meant to faithfully represent the saint’s actual remains, as though it were merely a cast. 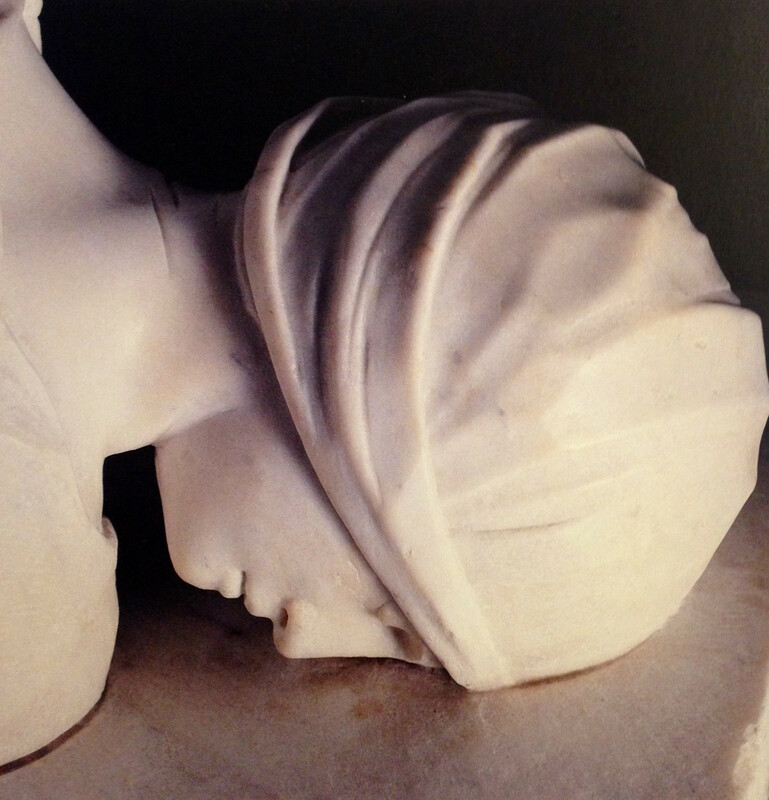 Whether Maderno executed the sculpture as Bosio recounts is unclear. However, we now understand just how fitting the intent to preserve its likeness was for Saint Cecilia, who ardently guarded her body against impurity and corruption. The humility that coincides with this rejection of “polluto amore” is abundantly represented with her “facie…ad humum procumbente.” Interestingly, Maderno actually did render her face, as you can see below. However, because of its purposeful placement, no ordinary visitor to Basilica di Santa Cecilia in Trastevere will ever see it. 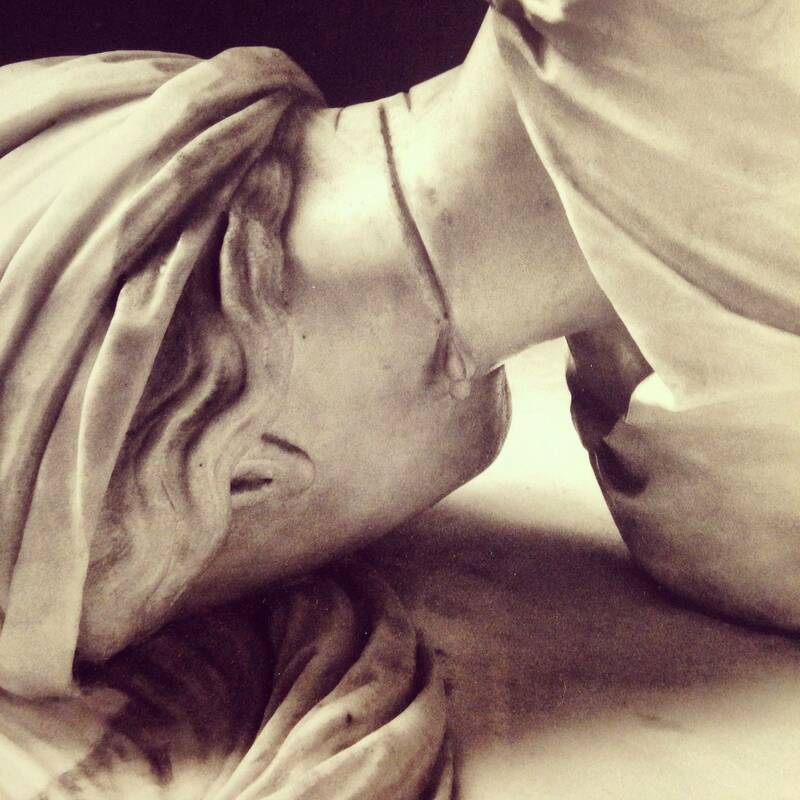 Maderno not only preserved Saint Cecilia’s body, but also her powerful humility. This entry was tagged Antonio Bosio, Baroque, Basilica di Santa Cecilia in Trastevere, Jacobus de Voragine, Legenda Aurea, Saint Cecilia, Santa Cecilia, sculpture, Stefano Maderno. Bookmark the permalink.